There�s cold weather and then there�s extreme cold weather. When you need a glove that protects well beyond sub-zero temps, reach for our new Commercial Grade Series Polar Pro Glove. A heavy duty TPR knuckle reduces impacts without compromising flexibility. Crafted with genuine goatskin, a waterproof nylon exterior and a 100g 3M� Thinsulate� lining, this glove is built for the kind of work that would make other gloves shudder. The glove for all-around light duty jobs. 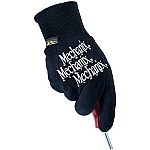 The Mechanix Cotton Glove is made from 100% heavyweight breathable cotton, making it feel cool and comfortable on your hands. Use them for those messy tear-down tasks and then throw them away, Or because its a high quality Mechanix glove, just drop them in the washer and use them again. Extended Cuff: Elongated knit cuff keeps glove secured whether under or over jacket sleeve. Waterproof Palm: MicroFinish� coating provides a secure grip while keeping palm and fingers dry.